The firmware update for the 279 FC allows you to save and view images on the meter itself. Images can still be transferred via Fluke Connect to your smart phone or tablet. The new firmware helps save time on the job by allowing you to confirm that images were captured correctly before sharing or leaving the work area. Existing images which are on your 279 FC will not be deleted. When the firmware upgrade is complete you will be able review these existing images on your 279 FC Thermal Multimeter. Download and install SmartView 4.3.75 to your PC. If you have an earlier version of SmartView, you will need to update to version 4.3.75. 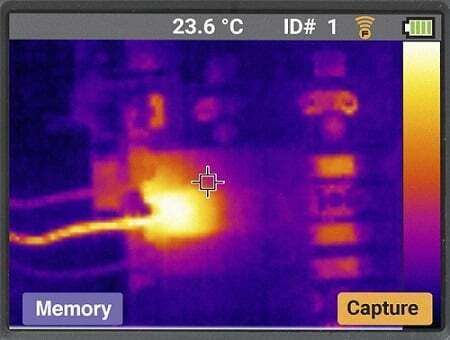 Go to www.fluke.com, Support, Software Downloads, Software for Fluke Infrared Cameras (https://www.fluke.com/en-sg/support/software-downloads/software-for-fluke-infrared-cameras). Click on the Download Windows version free link. This will save a file named setup.exe to your PC. 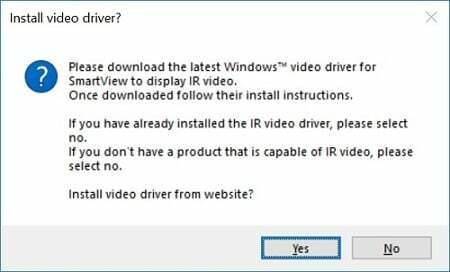 If prompted to install Windows video driver, click Yes. When SmartView (4.3.75) installation has finished, connect your PC to your 279 FC Thermal Multimeter with a USB-to-USB-mini cable. The 279 FC should power up on its own. Make sure the battery in the 279 FC is charged before you start. A prompt reading “Camera firmware” will appear on your PC. Click the “Update Firmware” button. The 279 FC will display “Firmware update V1.04. Downloading. Do not power off or disconnect.” Allow the meter to continue its upload of the new firmware. The “Firmware update” screen will disappear from the 279 FC when the process is complete. Turn the selection knob on the 279 FC to the IR CAMERA position. The lower portion of the 279 FC screen will show both Memory and Capture buttons. This indicates a successful firmware installation.